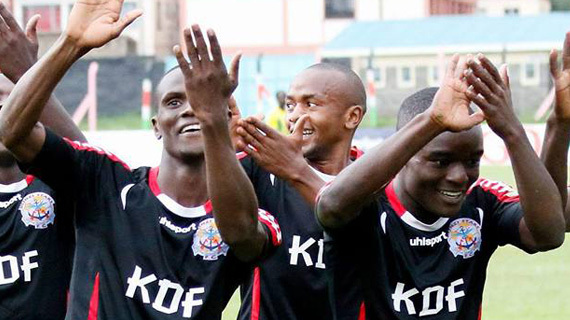 Three goals by John Mark Makwata on Saturday earned his team qualification to the finals of the GOTV Shield Cup finals as Ulinzi humbled Kariobangi Sharks 4-1 in the tournament's semi finals . Makwata was on the mark in the 57th ,59th and 76th minutes to add on to a 5th minute goal by Oscar Wamalwa as the soldiers paraded a sterling performance in their quest for silverware after a long dry spell. In his remarks after the match , John Mark termed the win as a solid team performance while also thanking God for his man of the match performance, " It was a good match ,always a joy to play alongside a very hardworking playing unit. Everyone added value to our win and we are excited to have qualified for the finals. He continued to say that , " We acknowledge that Tusker is equally a quality side and our approach will be key in the finals." John Mark is currently the national league joint top scorer having scored 12 goals this season to be in contention for the league's golden boot.